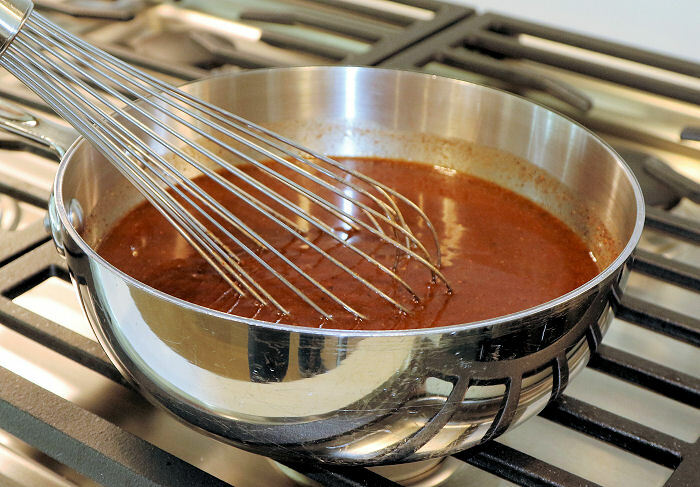 We have been meaning to try Aaron Franklin's recipe for a tomato-based BBQ sauce for some time. We wanted something for use with beef plate ribs, and this sauce really fits the bill. This is Aaron Franklin's Regular Sauce, also called his Classic Sauce. You will find this recipe in Aaron Franklin's book, Franklin Barbecue: A Meat-Smoking Manifesto . You'll also find it all over the internet on food and BBQ related websites. And you'll find they all have one thing in common: a somewhat puzzling ingredients list. We have sorted out the ingredients list for you and offer it up here for your BBQ pleasure. This sauce has some tang, a little bit of sweet and a little bit of heat. Aaron Franklin calls it a good all-purpose sauce. Combine all of the ingredients in a saucepan and warm over medium heat, stirring occasionally. There is no need to bring the mixture to a boil, just warm it enough to melt and integrate the ingredients. Once you have done that, remove the pan from the heat and let the sauce cool. Transfer to a container and you can store the sauce in your refrigerator for up to 1 month. 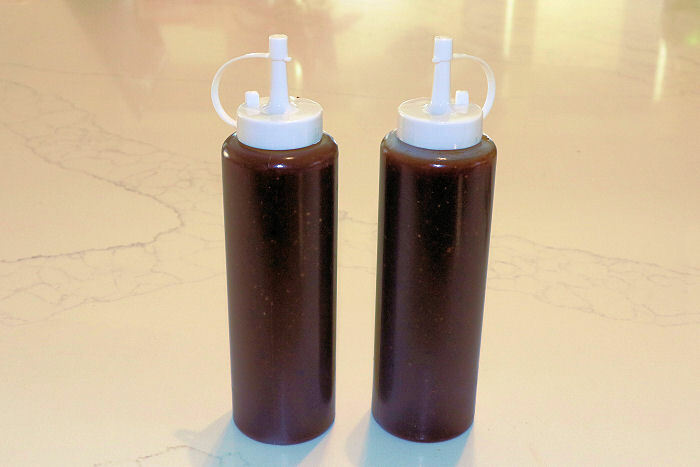 We placed our finished sauce into squeeze bottles that you can buy for $1 at Dollar General stores and other places that carry kitchen wares. As you can see, this recipe yields two of those bottles. Besides fixing the mistake in the original recipe and clarifying some of the amounts, we also converted his 1¾ cups of ketchup to 14 ounces of ketchup because it is possible to purchase 14-ounce bottles of ketchup. 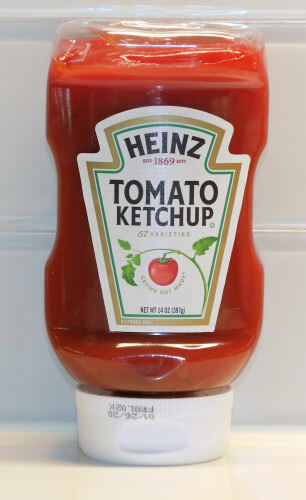 To the right you will see a photo of a 14-ounce bottle of Heinz ketchup that you can find in any grocery store. 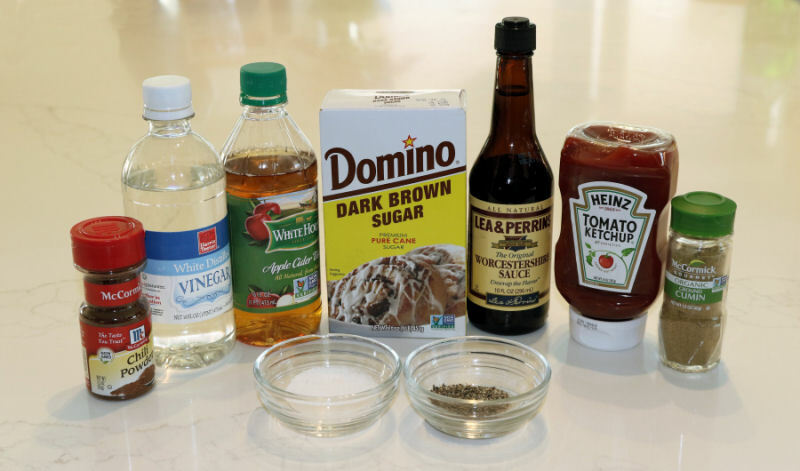 When time comes to make the sauce, you can empty the bottle of ketchup into your sauce pan, add the ½ cup plus 2 Tbsp water to the bottle, put the lid on, give it a good shake, and now you can pour the water and remaining ketchup into the sauce pan. Tomato concentrate, distilled vinegar, high fructose corn syrup, corn syrup, *Also Salt� salt substitute (potassium chloride, L-lysine monohydrochloride), spice, onion powder, natural flavoring. Organic tomato concentrate, organic distilled vinegar, organic cane sugar, salt, organic spice, organic onion powder, natural flavoring. Tomato concentrate, distilled vinegar, sucralose, salt, spice, onion powder, natural flavoring. Tomato concentrate, distilled vinegar, cane sugar, salt, spice, onion powder, natural flavoring. Tomato concentrate, distilled vinegar, honey, salt, spice, onion powder, natural flavoring.